Allison Beese | Research interests are in experimental and computational multiscale mechanics of materials. Steel is one of the most common structural materials, truly one of the foundations of modern civilization. Steel, an alloy of iron and carbon, has been made since biblical times, and Damascus steel was famous for its strength in knife and sword blades throughout the ancient world. Recently, a team of scientists in Germany discovered that the reason for its unusual ability to hold a sharp edge may have been from carbon nanotubes and nanowires that formed in the steel during processing. With two thousand years of experience in steelmaking, it would seem all there is to know about steel would already be known. For Allison Beese, McFarlane Assistant Professor in Materials Science and Engineering, the secret world of steel is still unfolding. "There is a lot known about traditional steels, but advanced high strength steels are a different story," Beese explains. "For example, traditional fracture models don’t accurately predict the properties of these advanced steels. We’re still trying to understand the mechanisms for damage accumulation and fracture, and steel companies are very interested in developing other designs for steel." In her temporary lab on the east end of campus where her department has been displaced while Steidle Building undergoes renovations, Beese and her students stretch pieces of high strength stainless steel in a test unit and use digital image correlation to quantify the deformations. A speckled pattern painted on the steel sample with spray paint is captured by a camera in one second intervals while software looks for the same pattern as its shape changes under applied deformation. The best steels have high strength in conjunction with ductility, the ability to be stretched. Alloying small amounts of materials such as manganese can add to steel’s strength, while phase transformations during processing or deformation can change the steel from soft to extremely hard and strong. Most importantly, she studies the effects of microstructure on mechanical properties. During her postdoctoral work at Northwestern, Beese studied the microstructure of carbon nanotube and graphene oxide composites. Taking insights from tough natural materials, such as mother of pearl, which has both strength and resilience due to its hierarchical microstructure and layers of hard inorganic and elastic organic materials, she and her collaborators designed bioinspired materials using carbon nanotubes and graphene oxide. She also used transmission electron microscopy to do in situ testing of the mechanical properties of strong but inexpensive carbon nanofibers. At Penn State, Beese is working with Joshua Robinson, assistant professor of materials science and engineering, to measure the mechanical properties of 2D films his group is synthesizing and characterizing. "I am primarily an experimentalist in trying to understand the connection between microstructure and macroscopic mechanical behavior. Through the understanding of deformation mechanisms, we can then develop predictive models," she says. Additive manufacturing, commonly known as 3D printing, is a rapidly growing technology with large implications for industry. However, especially when it comes to printing metallic materials, much remains to be learned. Penn State has been named the metals node for America Makes, the national 3D printing initiative. In the Center for Innovative Materials Processing Through Direct Digital Deposition (CIMP-3D), the resources and experience in lasers and materials of Penn State’s Applied Research Laboratory and Materials Research Institute are focused on developing a basic understanding of layer by layer fabrication in order to build structural components for automotive and aerospace applications, among others. Here, metal is deposited in a desired location, melted with a laser, and then as it solidifies, it fuses to the layer below. "Rapid thermal fluctuations as the laser heat source scans over the material one layer at a time will dictate the microstructure of the deposited metal, which in turn will dictate the mechanical properties," Beese explains. 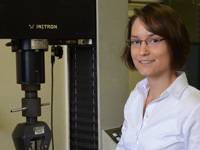 Her group has been testing relatively large components, or walls, of an additively manufactured nickel superalloy (Inconel 625), a stainless steel (304), and a titanium alloy (Ti-6Al-4V). By carving out a smaller sample from the walls, her group can measure mechanical properties as a function of the location and direction of the layers. They have found that ductility is dependent on the direction of the build, while strength varies at different heights. This is a result of differences in the way heat is dissipated, as well as the thermal cycles, as more material is deposited. "People who directly make small 2D samples for testing are not going to see these differences, which are important since they will show up in large scale structural components," she points out. Beese has two students working on the 3D project who are funded by the National Science Foundation. She also has half a dozen undergraduates in her lab working on different projects. She sees working with undergraduates as a good way to encourage them to go on to graduate school or as training for working in a group setting in industry. "It’s rewarding to mentor undergraduate and graduate students individually. It’s especially helpful for undergraduates to have a chance to apply their classroom learning in the lab. My goal with respect to the graduate students is to help them to become independent researchers," she says. Beese earned her own undergraduate degree in mechanical engineering at Penn State. From there she went into industry at Lockheed Martin’s Knolls Atomic Power Laboratory in upstate New York. She earned her M.S. and her Ph.D. degrees in mechanical engineering with a minor in biomechanics at MIT. As a postdoc at Northwestern, she mentored numerous graduate students, helping them to determine how to accomplish their research goals. Beese’s twin sister has pursued a similar path, only in science rather than engineering, and is currently a postdoc in genetics at Harvard. 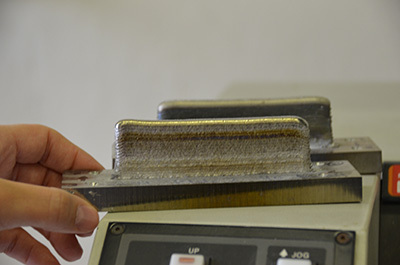 Additively manufactured samples (walls) of nickel superalloy (Inconel 625) and a titanium alloy (Ti-6Al-4V) are being tested by Beese and her students.